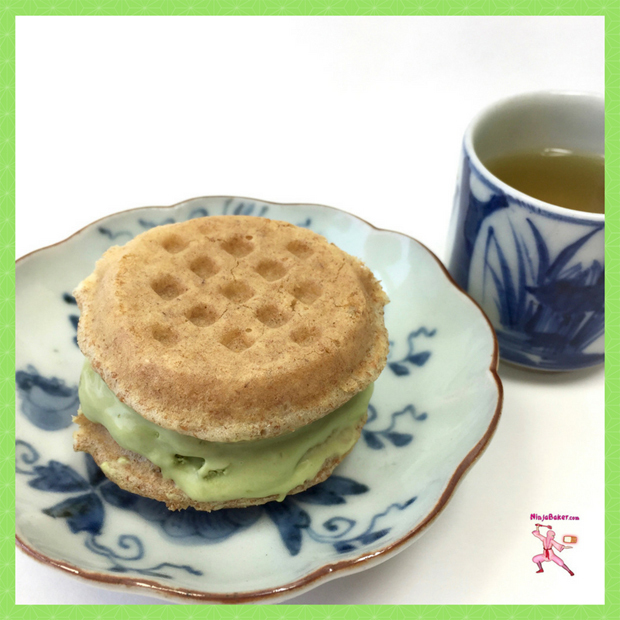 If you love Japanese matcha, honey, ice cream and waffles, this yummy teatime treat is destined for your dessert table. Add more matcha though if you love a bold matcha tea taste. A note of Japanese matcha breezes through the honey-laced ice cream. The American waffles create a welcome contrasting crunch. The no-churn ice cream recipe is adapted from Martha Stewart.com. In a deep bowl, whisk together the condensed milk, vanilla, and honey. In a kitchen stand mixer, beat heavy cream on high until stiff peaks form, 3 minutes. With a rubber spatula, gently fold whipped cream into condensed milk mixture. Pour into a 4 1/2-by-8 1/2-inch loaf pan lined with parchment paper. Freeze overnight. Make homemade waffles or toast store-bought waffles. Allow to cool. Scoop matcha ice cream into the waffles.